This yoga home program weaves together breath work, meditation, body awareness, and gentle movement to give you the strategies to decrease your pelvic pain and move through your life with more ease. 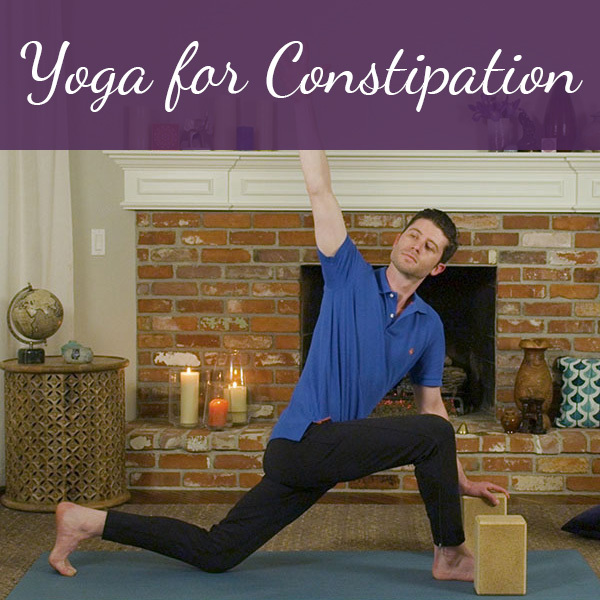 This home yoga program, created by Dustienne Miller, board certified women’s health physical therapist and Kripalu-trained yoga teacher, is designed for men and women who are healing chronic pelvic pain. 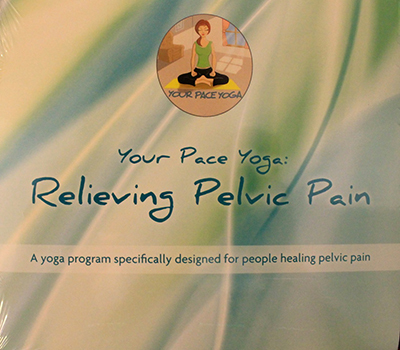 Your Pace Yoga: Relieving Pelvic Pain can be practiced in as little as 20 minutes, setting you up for a successful home program implementation. The video brings together breath work, meditation, body awareness, and gentle yoga postures to give you strategies to decrease pelvic pain and move with increased ease. In this video, we focus on down-training the nervous system and releasing the muscles that attach to the pelvis and hips. Learn more in the “Relieving Pelvic Pain” blog article. encourage breathing techniques to optimize the relationship between the diaphragm and your pelvic floor. The first flow (23 minutes) is a more active practice. 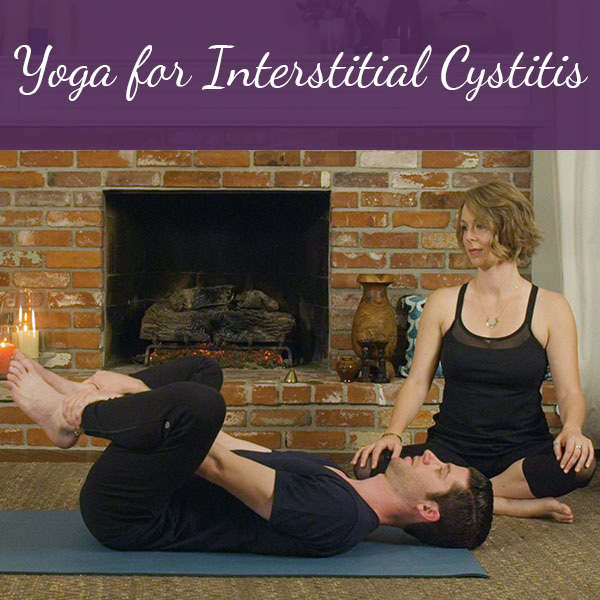 It starts with sitting warm-ups, works up to standing postures, and ends with relaxation. The second flow (20 minutes) is more quieting. During this gentle program, one does not leave the floor. The relaxation phase of the practice allows you to experience the physical letting go of your muscles relaxing and stress melting away. Educate yourself about the anatomy of the pelvic floor. Knowledge is power! Did you know that how you stand and sit has a direct affect on the pelvic floor? Learn how to find the ideal standing posture in this bonus track. Breath-work is an important aspect of both yoga practice and how we work with the nervous system. Remember that your preferred breathing method is what matters, but there are options to mix it up and practice dirga, ujjayi, or simply a letting-go breath. Relieving Pelvic Pain was recommended to me by my Pelvic P.T. – I had no experience with yoga at the time but found this DVD very easy to do and very beneficial. I have been using it for about 1 1/2 years, it has helped me to manage my pain and is my “go to” during pain flare ups. The meditation portion of the DVD was very helpful, clearing the stress of my illness from my mind and helping me “reset”. Thank you Dustienne. 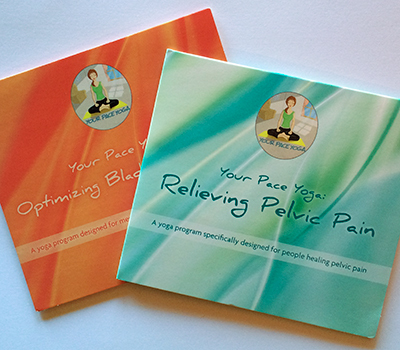 I am a pelvic floor physical therapist, and I have been recommending Dustienne’s home yoga programs for years. Dustienne is incredibly skilled and knowledgeable, and her movement sequences have helped so much with many of my patients dealing with pelvic pain and many other pelvic floor conditions. I would strongly recommend her home videos to clinicians and patients alike! The first asana includes some movements and stretches that I have not done before and are helpful to temporarily provide some relief of pelvic pain and vulvodynia related to pudendal neuralgia as well as some concurrent hip issues. I didn’t realize that some of my muscles in adjacent areas were sore and tight and contributing to the problem bi prefer the first asana. Dustienne is calming throughout and this is easy to follow even if you have no experience. Also each asana is short enough that it’s not intimidating or drudgery to do it. Hooray! So happy to hear you found this video helpful Katherine. The length is exactly what I was going for – keeping it quick enough that it’s not intimidating time-wise at the end of the day. I’m so thrilled! Continued success with your pain relief.